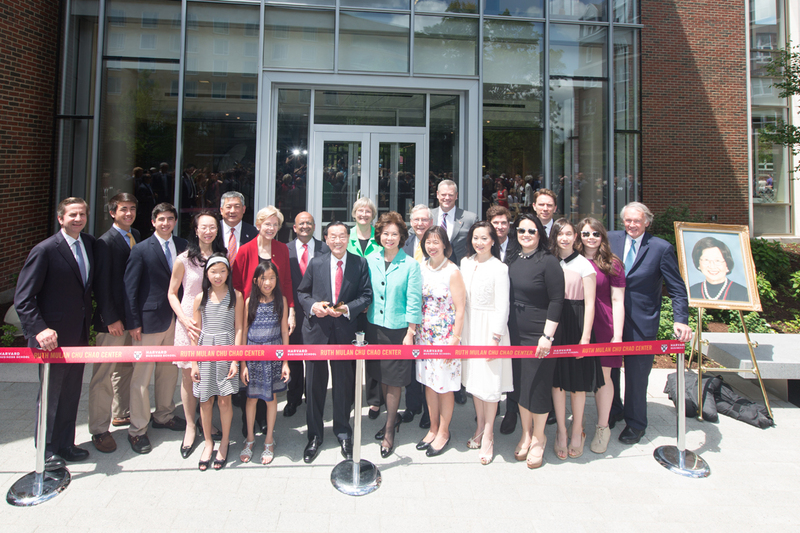 BOSTON—Harvard Business School (HBS) inaugurated its new anchor building in the Executive Education program - Ruth Mulan Chu Chao Center—with a dedication ceremony on June 6, 2016. 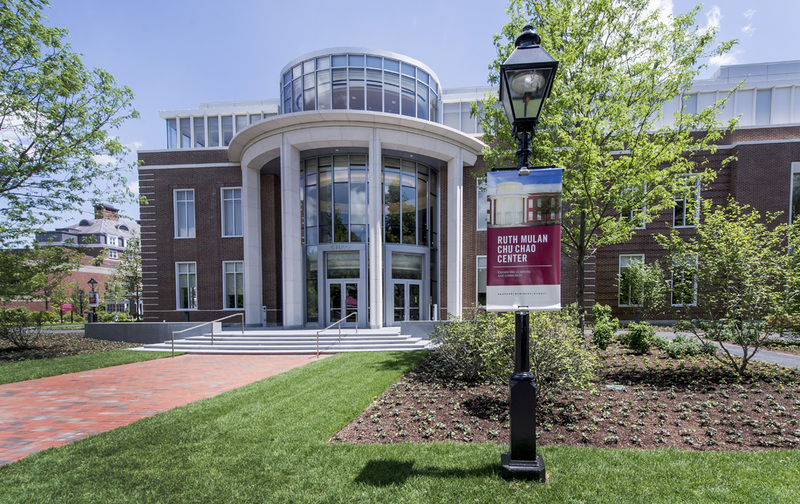 The ribbon-cutting ceremony included remarks by Harvard University President Drew Gilpin Faust, Harvard Business School (HBS) Dean Nitin Nohria, Massachusetts Governor Charles Baker, U.S. Senator Elizabeth Warren (D-MA), U.S. Senator Ed Markey (D-MA), and speaking on behalf of the Chao family: the 24th U. S. Secretary of Labor (2001-2009) The Honorable Elaine Chao (HBS MBA 1979) and Deputy Chairman, Foremost Group Angela Chao (Harvard A.B. 1995; HBS MBA 2001). The building was made possible by a $40 million gift from a Dr. James Si-Cheng Chao and family foundation. This generous gift was given in tribute to the life and legacy of the late Ruth Mulan Chu Chao, beloved matriarch of this most prominent and accomplished Chinese-American family. Family photo of Dr. James S. C. Chao, Chairman, Foremost Group, & Benefactor (center) with dignitaries celebrating dedication of Ruth Mulan Chu Chao Center, Harvard University. Boston, MA: Harvard University President Drew Faust; Harvard Business School Dean Nitin Nohria; Massachusetts Governor Charlie Baker; Senate Majority Leader Mitch McConnell; U. S. Senator Elizabeth Warren; U. S. Senator Ed Markey. The Chao daughters: May Chao, 4th from left; Grace Chao, 4th from right; Angela Chao, 5th from right, Christine Chao, 6th from right; Elaine Chao, 7th from right. Dr. James S. C. Chao and Mrs. Ruth Mulan Chu Chao have six daughters: Elaine Chao, Jeanette Chao, May Chao, Christine Chao, Grace Chao and Angela Chao, four of whom attended Harvard Business School, the only family in HBS history to have four daughters attend. This gift was made in April of 2012 during the 50th anniversary celebration of the admission of women to Harvard’s two-year MBA program and the 375th anniversary of Harvard University. It is the first building named after a woman on the Harvard campus and the first building named after an American of Asian ancestry. As part of the gift, the Chao family has also endowed the Ruth Mulan Chu and James S. C. Chao Family Fellowship Fund to outstanding students in need. Harvard Business School Dean Nitin Nohria believes that the Ruth Mulan Chu Chao Center reinforces the importance of the physical campus in the age of online learning. “Online learning creates many new possibilities in the educational arena,” he said. “But the human interaction that takes place on our campus is at the heart of transformational learning. And for generations of executives from all of the world, that transformational experience will begin in the Ruth Mulan Chu Chao Center”. The family also received letters of congratulations from President Barack Obama, George W. Bush, Bill Clinton, George Bush, Jimmy Carter and Vice President Joe Biden. The Ruth Mulan Chu Chao Center is a 90,000-square-foot, four-story Gold certified LEEDs structure that will be the gateway to the University’s Executive Education Program. This building anchors the Executive Education campus and is the center where all executives attending these programs will be greeted. In addition to a reception and registration area, the building offers an open theater-style forum with expansive seating capacity, state-of-the-art classrooms, meeting rooms, offices and dining facilities and an elevated outdoor terrace. Architectural firm Goody Clancy designed the new building, which was completed in 2 years. Photos for use by media are available here. Background on Dr. James S. C. Chao and Ruth Mulan Chu Chao Family: The Chao family is the quintessential American success story. Dr. James S. C. Chao and Mrs. Ruth Mulan Chu Chao saw their ancestral home torn apart by civil war, foreign invasion, and domestic upheaval yet they maintained their optimism and hope. Accomplished at a very young age, Dr. Chao became one of the youngest sea captains of his time in the merchant marine at the age of 29 and earned the top score in the national examinations breaking all previous records. This achievement gave him the opportunity to study in America. At that time, Mrs. Chao was seven months pregnant with their third child but she supported his bold decision to build a better life for the family. The family was reunited three years later and Dr. Chao founded what is now the Foremost Group, an internationally respected shipping company in New York. A scholar of Asian history and literature and generous philanthropist, who left her mark on all who knew her, Mrs. Ruth Mulan Chu Chao was the mother of six daughters who went on to successful careers after receiving undergraduate and graduate degrees from some of America’s finest universities. Elaine Chao: Mt. Holyoke College and HBS; Jeanette Chao: Smith College, MBA from College of William and Mary; May Chao: Wellesley College and HBS; Christine Chao: Colgate University and JD from Columbia Law School; Dr. Grace Chao: Wellesley College, HBS, Ph.D. Columbia University; Angela Chao: Harvard College and HBS. Click here to see an interactive photo exhibit chronicling the Chao family history. Read Secretary Elaine Chao's remarks from the dedication ceremony. Read Dean Nitin Nohria's remarks from the dedication ceremony. Read Angela Chao's remarks from the dedication ceremony luncheon.